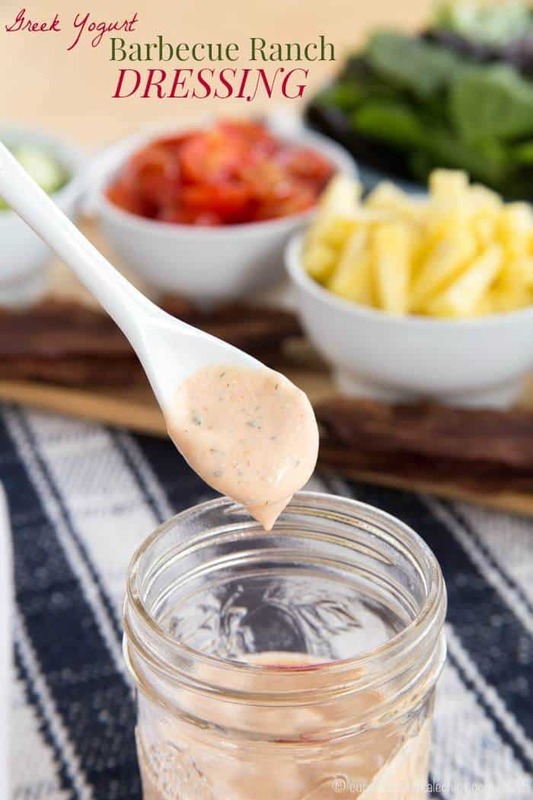 Add a little sweet and tangy zing to everyone's favorite dressing or dip. Greek Yogurt Barbecue Ranch Dressing is one of my favorite easy gluten-free salad dressing recipes, perfect for all of your summer veggies and salads! 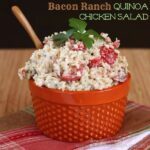 Ranch salad dressing is a perennial favorite, and it just takes one simple addition to my basic recipe to add a little zing so that you can make copycat recipes of many favorite restaurant salads. So here’s my problem. My two-year-old still needs a nap in order to not be a miserable, unbearable mess in the late afternoon. My five-year-old can often use a nap, but refuses to take one. When he happens to be utterly and completely exhausted to the point of not being able to keep his eyes open and we get him to take a nap, if he sleeps for so much as thirty minutes, he doesn’t fall asleep until 11 pm, regardless of what sorts of activities we do in the evening and how early or late we start bedtime. So we usually just forego the nap and start bedtime at around 7pm. If he isn’t that tired he will read books or whatever until he is ready to sleep. When he’s is fairly tired, he’ll fall asleep right away. If he is insanely overtired, he will roll around and keep himself awake until 11 o’clock, which inevitably means he is up at 5 am. Though truthfully he does usually sleep till 6 or 7 o’clock, and he will just stay in his room and read quietly, so I’m ok with that. The little dude, on the other hand, lately seems like he isn’t actually ready to sleep until 9 pm, despite telling us at 7 pm that he is tired and it is bedtime. And even if we try to take the boys up to be separately, Little Dude either wants to go up with big brother, or big brother whines that it’s not fair that little brother gets to stay up. So for the past few weeks, Little Dude would go up with all of us at 7 pm, I’d rub his back, he’d be nearly asleep or doing a really good acting job, and then, as soon as I leave them room, proceed to scream to get someone to come back, no lie, five to ten times to recover him with his blankies. Yes, I did mean that to be plural. He has two and they both had to be on him, and Elmo and Big Bird had to be laying on his pillow, and his train book and plane book and tractor book and digger book and potty book all had to be at the foot of his bed. If there is one way to make sure you get your daily 10,000 steps, just have a demanding two-year-old and a lot of stairs. In just the past couple of days he has started to accept that Mommy and Daddy are going downstairs, and he can read books or play with his toys, and yes, he is capable of putting his blankets on himself when he is ready to go to bed. Thanks goodness. Well, until he is up and ready to go at 5 am, NOT staying in his room like his big brother. Oh, and what I said about his big brother sleeping till 6 or 7, but then staying in his room – well that is unless little dude wakes up screaming or busts out of his baby gate and runs down the hall looking for his now-no-longer-sleeping big brother. And let’s not even talk about the fact that they have no concept of Saturday or summer vacation. Basically I’ll sleep when I’m dead. Or when my boys are lazy teenagers, I’ll start clanging pots at 5 am as paybacks. But seriously, a 5-year-old who is ready for bed at seven and a 2-year-old who isn’t ready till nine – how do I manage this one? 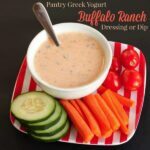 My basic healthy Ranch Dressing recipe takes only basic pantry ingredients, it’s made with Greek yogurt so it’s light, healthy and packed with protein, and it’s a surefire way to get kiddos to eat their veggies. 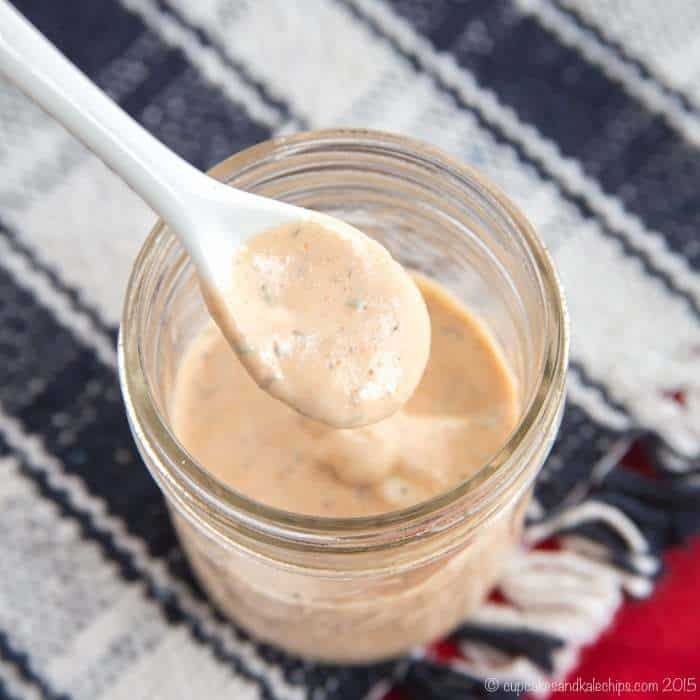 Add a bit of barbecue sauce (Stubb’s is my favorite), and you get a hint of sweet, tangy zing in my Greek Yogurt Barbecue Ranch Dressing. I mean, it’s like crazy stupid easy to change up classic Ranch with a flavor that the kids still love. 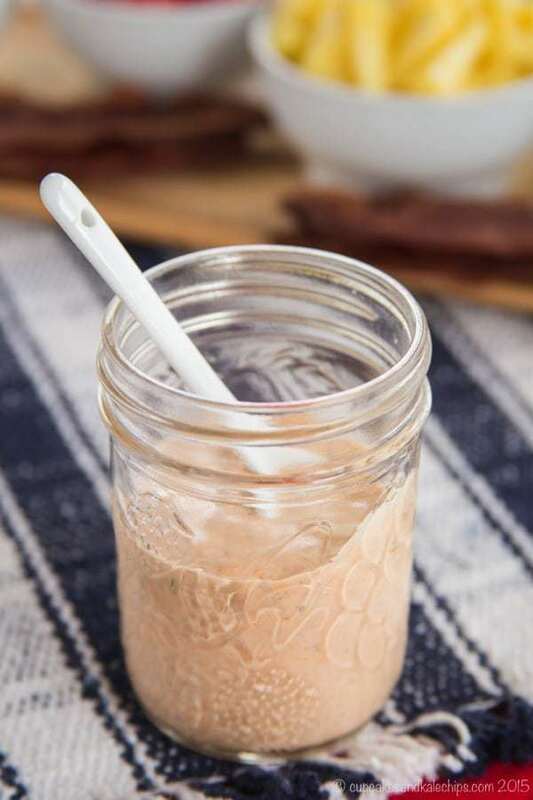 Pack it into camp lunch boxes with carrots and cucumbers – that’s a snack that make my boys happy. Doesn’t help them sleep any better, but at least it stops their constant demands for food. 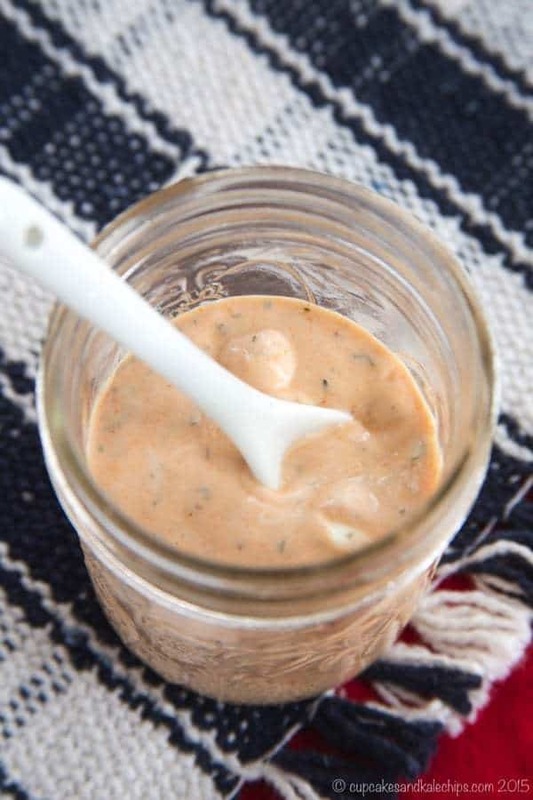 But in the meantime, just make the Greek yogurt barbecue ranch dressing! Seriously, how can I get my kids to sleep in on the weekend or during the summer? Combine all of the ingredients in a bowl and mix until thoroughly combined. If possible, let sit in the refrigerator for at least a couple hours to allow the flavors to develop. Love this dressing. Added a little apple cider vinegar, left out the dill (didn’t have any fresh so), and used fresh garlic. 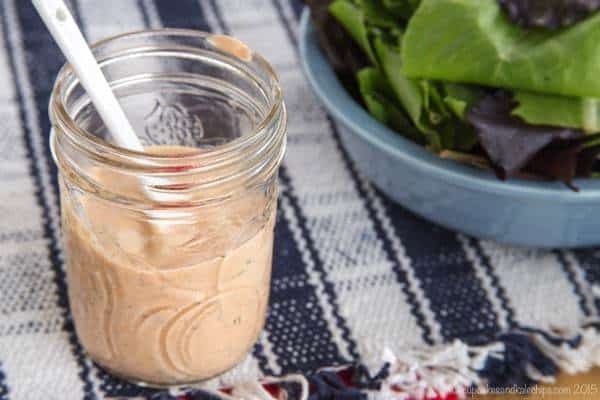 Fun, creamy, barbecue dressing. I’m so happy to hear that you enjoyed the dressing, Nicole. 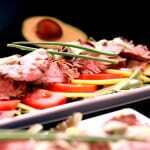 Thanks for your comment and rating of the recipe! You could try substituting a tablespoon of freshly minced onion and 1 clove of finely minced garlic for the dry spices. I have three kids and two of them will sleep in but the third is always the first to bed and the first to rise! 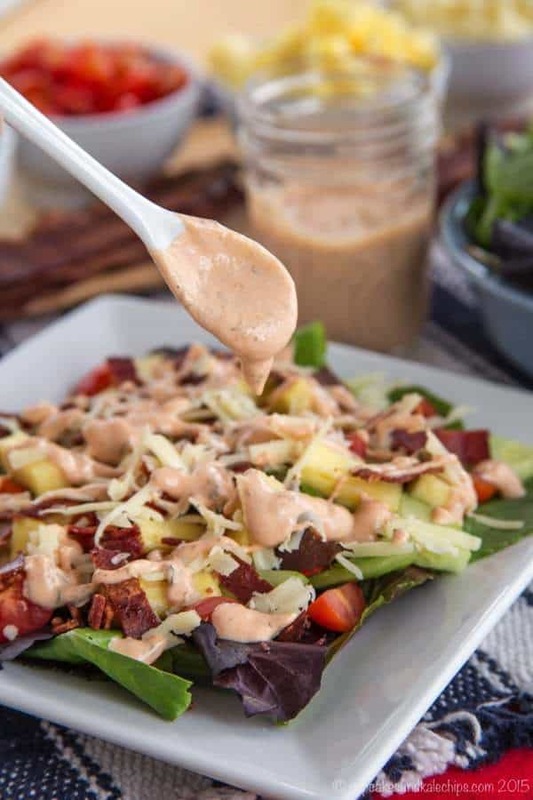 This dressing sounds amazing and thank you for the shout out!